Our studio is heading in new directions with the ART+COM Explore lab: located outside our main studio, the lab will spend four months researching the future of media spaces and will share its process and results with experts and the public. With Raphaël de Courville, who runs ART+COM Explore, product designer Javier Díaz aka Edokoa, interaction designer Aurelia Friedland, Software/Hardware Engineer Sebastian Zappe and media artist Raffael Ziegler aka Moco bring in their individual expertise to the research at ART+COM Explore. In this interview, Raphaël talks about the aims of the ART+COM Explore project. Susanne: Research has always been an integral part of ART+COM’s work, but it’s maybe less visible than the studio’s other activities and projects. Now ART+COM Studios is setting up a temporary research lab at Collegium Hungaricum Berlin (CHB). What’s the idea behind this initiative? Raphaël: ART+COM Explore is a self-commissioned pilot project focused on research and development in the field of media spaces. It brings together a team of experts from various disciplines in the same physical location and gives them the tools, resources and support they need to experiment and produce prototypes. The CHB is hosting the program in the heart of the city, right next to Museum Island. We wanted to take our research outside of the studio and make it more visible, to build a tighter connection with the vibrant communities and individuals of Berlin, and to give back some of the creative energy that we get from the city. The venue itself is a mirror of that mind-set; inclusive and open to the public through workshops, collaborations, exhibitions and more (follow us on Twitter or Facebook for announcements of events and presentations that will take place here in the future). The CHB team is doing an amazing work helping us bringing this vision to life, and we couldn’t have dreamt of a better partner for this project. Susanne: So where do you see the future of media spaces? How will future media spaces differ from the spaces we build today? Raphaël: I see a lot of potential with the recent advances in connected technologies. In its top 10 technology trends for 2016, Gartner listed the concept of Ambient User Experience, which refers to an interactive experience that “seamlessly flows across a shifting set of devices and interaction channels (…) as the user moves from one place to another.” By contrast, most media installations today, no matter how immersive, are isolated kiosk-like experiences confined to the exhibition space. Ambient User Experience could open an entirely new subcategory within exhibition design. This is a fantastic opportunity for interaction designers, architects and engineers alike (to name only a few). It is also a major challenge that demands a radical shift in the way we think of, and build, interactive environments. Susanne: Isn’t that what the Internet of Things is all about? Raphaël: It is part of it. However, our approach is focusing on the experience of space as a whole, rather than one specific app, technology or use case. Everybody is trying to build the one device that will make the Internet of Things (IoT) indispensable; yet, the really desirable applications for IoT might not be the most spectacular or even have an obvious market. Besides, consider the rampant incompatibility issues between IoT devices and infrastructures. Understandably, experience design often takes a backseat to tackling pressing engineering and marketing issues. ART+COM, on the other hand, designs interactive environments at a large scale and from the ground up. We don’t have to take sides in the raging war between standards, and can ignore most of the constraints that go into producing consumer electronics. Therefore, we are in a privileged position to address the question of ambient user experience from a design perspective. Susanne: So what’s to gain from the interaction with objects and space? Or to put it differently: what inspires your research? Raphaël: Properly designed ambient interactions have the potential to help us better understand and control our environment. Mark Weiser’s concept of calm technology is an important influence. For Weiser, technology is calm when it “move[s] easily from the periphery of our attention, to the center, and back.” Think Jonze’s ‘Her’ rather than Spielberg’s ‘Minority Report.’ Weiser reminds us to be mindful of how the technology we put in the world is affecting us. His advice will become increasingly relevant as technologies “weave themselves into the fabric of everyday life.” This “digital emulsion” (to borrow Eliot Woods’ metaphor) of space and technology will require a new, subtler, kind of interaction design. Storytelling techniques will help structure our early attempts, as we get more familiar with the extended language of interaction that spaces call for (we may then explore more non-linear forms). Narrative experiences like ‘Dear Esther’ or ‘The Stanley Parable’ are extremely inspiring in the way their authors use space to tell a story. Susanne: In how far is your research interdisciplinary? What do you think you can learn from involving experts of different disciplines and in which way will they be contributing to the research? Raphaël: Excluding some notable exceptions, ambient interactive environments are still a largely uncharted territory. It is an emergent problem that cannot be solved using the tools of one single discipline. This is why we need to involve experts from various fields in the conversation. The ART+COM Explore team itself is a rare mix of hybrid profiles. Our experts all have experience and knowledge of multiple fields, such as user interface design, electronics engineering and computer science. In the near future, we will get more people involved through workshops, talks and, if possible, short residencies. Susanne: You’re at the very beginning of your investigation of future media spaces. Can you already tell which direction you’re research is taking? What are you currently occupied with? Raphaël: Ultimately, we want to achieve a continuous experience as people move through an environment. 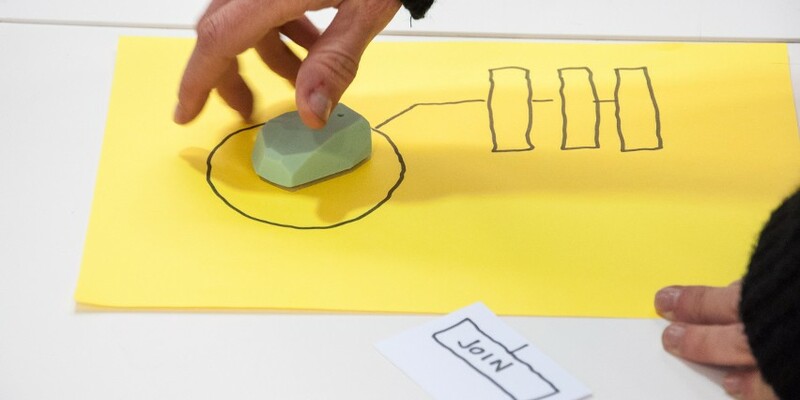 Interaction on demand is an interesting avenue of research: letting users contextually interact with any compatible environment using their own devices (the Physical Web is a promising implementation of that paradigm, using wireless beacons linked to web applications). We are also researching tangible and token-based interaction. For now, we focus on building technical or working prototypes, to evaluate the quality of the experience. We are still getting our feet wet with the technology and the concepts. As we get more prototypes built, we’ll start connecting things together and designing the experience on a larger scale… That’s where the real fun begins! Susanne is an art historian and curator based in Berlin and runs the ART+COM Studios blog. In her curatorial work and teaching, she focuses on media art as well as on participatory and collective art processes.